The CMS plans to open a new 30-day federal public comment period on Kentucky's Medicaid work requirement demonstration as a way to overcome a federal judge's objections to the way the waiver was approved. A CMS spokesman said Wednesday that the new public comment period on the Kentucky demonstration, first reported by Politico, would "better inform any future decision on the demonstration that was remanded back to the department for further review." Catherine Easley, of the Kentucky Cabinet for Health and Family Services, said the CMS has not yet provided details on the timeline or likelihood for approval of the waiver following the comment period. "With that said, Kentucky is confident that Kentucky Health is well within the discretion of HHS to approve, and we will continue to target our preparations for re-approval on the earliest possible date," she said. But lawyers who oppose the Trump administration's push for Medicaid work requirements say that simply offering a new public comment period won't be enough to demonstrate that the work requirement is consistent with Medicaid's prime objective of providing coverage to low-income and disabled people. Jane Perkins, legal director of the National Health Law Program, one of the advocacy groups that successfully sued to block the Kentucky demonstration, said she's heard that the CMS now hopes to have Kentucky start the work requirement program on Sept. 1. 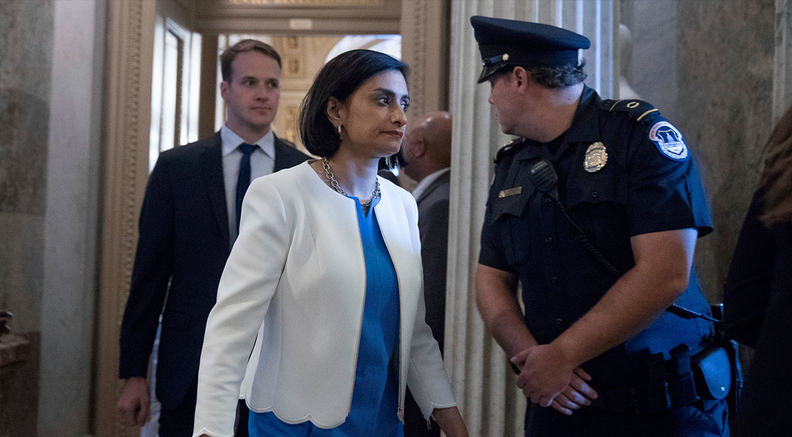 She also pointed to CMS Administrator Seema Verma's recent comments that her agency wants to go ahead and approve other states' work requirement waivers. "We continue to believe work requirements and some of the other restrictive cutbacks in the waiver are inconsistent with the Medicaid Act," Perkins said. "Seema Verma's statements combined with the very short comment period and the planned September start date cause us concern about whether this will be a fair review process." Kentucky's five-year waiver, approved by the CMS in January, represents the first time the federal government allowed a state to impose a work requirement as a condition of Medicaid eligibility. Since then, the CMS has approved waivers in Arkansas, Indiana and New Hampshire. Arkansas' work requirement started in June, and people who don't satisfy the requirements could start losing coverage in September. At least nine more states have applied for work requirement waivers or plan to apply. But on June 29, U.S. District Judge James Boasberg in Washington, D.C., an Obama administration appointee, held that the HHS secretary's approval of the Kentucky waiver failed to take into account the primary objective of the Medicaid statute, which he said is to furnish medical assistance. He sent the waiver back to the CMS for further review. Under the Kentucky demonstration that was scheduled to start in July, beneficiaries who are not disabled have to complete 80 hours per month of employment or other community engagement activities to maintain their Medicaid eligibility. That applies to traditional Medicaid beneficiaries and the expansion population. All beneficiaries will have to regularly document their compliance or prove that they qualify for an exemption. The CMS and Kentucky Gov. Matt Bevin's administration argue that requiring people to work or participate in other community engagement activities will improve their health and help shift them into commercial health insurance. The waiver also establishes premium payments, cost-sharing, a lockout for failure to pay, ends retrospective eligibility and eliminates medical transportation that isn't for emergencies. The Trump administration has made work requirements a centerpiece of its approach to Medicaid and other safety net programs. "We are very committed to this," Verma said at a Politico event Tuesday. "We are looking at what the court said. We want to be respectful of the court's decision while also wanting to push ahead with our policy initiatives and our goals. … We are trying to figure out a path forward." But it's far from clear whether a new comment period will be enough to satisfy Judge Boasberg's concerns about the validity of HHS' approval of the Kentucky waiver. In his decision, he repeatedly pointed to the state's own estimate that 95,000 people would leave Medicaid over five years due to the waiver changes. Outside groups predict the number of people who lose coverage will be far larger. "The secretary must adequately consider the effect of any demonstration project on the state's ability to help provide medical coverage," Judge Boasberg wrote in his 80-page decision. "He never did so here." The new comment period could allow the Trump administration to present its new research on the impact of work requirements on beneficiaries of safety net programs, and show that it adequately considered how the Kentucky demonstration would affect coverage. The CMS has not yet offered details on how it would structure the new comment period, and whether it would open up the entire Kentucky waiver for comment or only parts of it, Perkins noted. But the administration still may face challenges in convincing the courts that a work requirement is consistent with the Medicaid statute. "The CMS' decision indicates its optimism that despite the mountain of evidence to the contrary, there somehow is a reasonable basis to justify its position that reducing coverage for potentially hundreds of thousands of people … will further Medicaid's objective of insuring the poor," said Sara Rosenbaum, a professor of health law at George Washington University who opposes work requirements. "This is magical thinking at best." On the other hand, James Blumstein, a health law professor at Vanderbilt University, thinks the CMS' action could help the government's position in the Kentucky suit. "The judge found the original (HHS approval) procedure faulty, but did not say that cleaning that up would automatically lead him to approve it," Blumstein said. "The government should be able to position itself in an improved posture." The CMS' decision to open a new public comment period could signal that the administration does not plan to appeal Boasberg's ruling, Perkins said. Or it could both re-open the comment period and file an appeal. If there is an appeal, legal observers believe the case eventually could reach the U.S. Supreme Court, which, by that time may include President Donald Trump's recent conservative nominee, Brett Kavanaugh.